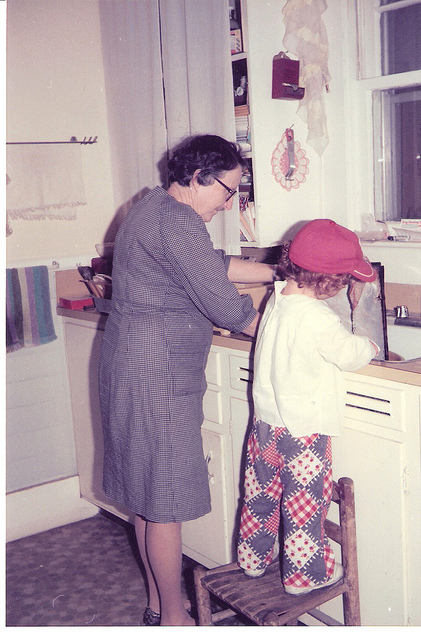 Gentle Readers, sometimes one has all the time in the world to create a culinary masterpiece, and sometimes one must PUNT! In the spirit of football season and tailgating parties, here are two recipes devised to save time and save face. Speaking of saving face, looks like the crowd approves the side dishes. Or you took selfies with my phone. If you have to feed a crowd in a hurry, what better choices than baked beans and potato salad? But on a busy weekend during the school year, however much I may like to start from scratch, I will compromise and doctor store-bought. I even signed my name to one of them. 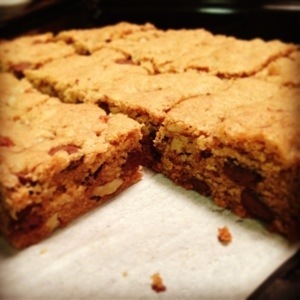 Mildly doctored blondies: wasn’t blown away by this mix, better from scratch. But they are pretty. I bought this beauty from SuperTarget, selected for quantity, price, and not being overly mayo-filled or celery seed laced. I have evolved in my acceptance of celery over the years, but I am unyielding on those celery seeds. They are not delicious to me. I digress. 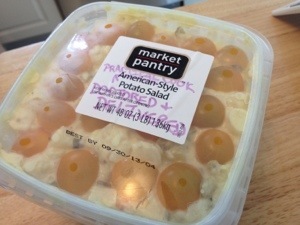 Specially doctored by The Practical Cook: SuperTarget Potato Salad! Now you have a decision to make–is the container large enough to stir in your add-ins, or do you need to mix in a separate bowl? I’ll wait while you sort this out. Now you also must decide whether you own the doctoring or go full out and pass it as your own in a nice bowl. Regardless, stir in the yellow mustard (a healthy dose if you want to offset mayo), relish, parsley (will make it taste fresh, don’t overdo it), and a dash of hot sauce (like Tabasco, and I mean just a dash) until fully blended. Top with sliced cherry tomatoes. Serve with a smile on your face. I adapted this recipe from Beer-Can Chicken, an amazing little cookbook that I worked on promoting many years ago. It calls for ribs and a grill, but bacon and an over work just fine, too. 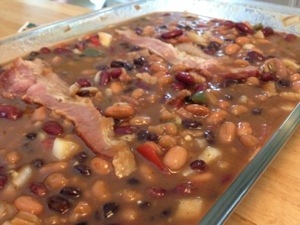 Beer and Bacon Baked Beans before the oven! Mix it all up in a 9 by 13 glass dish (or aluminum one if you’re wanting to toss it later), heat in a grill or in a 375-400 degree oven until bubbling and reduced. Thank me later, but feel free to invite me to your tailgate party now. 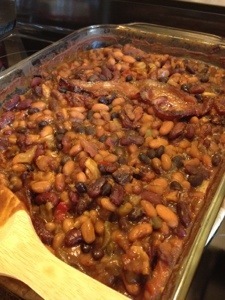 Beer and Bacon Baked Beans Completed! What are your favorite things to buy and make better? Post a comment here or Tweet my way! 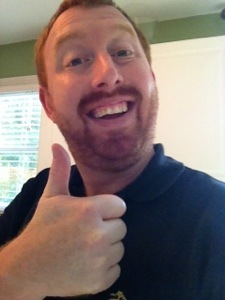 Special thanks to #vGingerBeard and family for the invitation and the unsolicited thumbs up. Coming up Sunday: Weekly Menus!